Thanksgiving is fast approaching. A fun holiday for us and our family has the potential to be problematic for our pets. Believe it or not the trouble can start while we are cooking, with pets trying to get scraps of food. A ham or turkey may come wrapped in string that might seem delicious to your pet. However, if they eat the string that the meat or poultry comes wrapped in, we will have Trouble with a capital T. Most dogs just cannot resist the temptation. Make sure the string is disposed of in a sealed container out of the dogs reach. Eating string and other indigestible products can lead to an obstruction. As the day moves on friends and family will be coming over. There may be a lot of commotion, noise and people that are unfamiliar to your pet. Please provide a safe place for your pet to hide and be left alone. They need to have a quiet place to escape (just like we do), when it gets to be too much with food, water and a comfy bed. 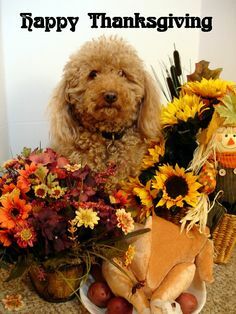 Now that it is time to sit down and eat you may have the urge to feed your dog a special treat for Thanksgiving, they are part of the family right? Yes, and No. Strange foods and diet changes are hazardous to your pets’ digestive system. These changes can potentially lead to vomiting, diarrhea, and a very sick pet. Give only a small amount of table food on top or mixed in with your pets regular dinner. Many foods are poisonous to pets, including but not limited to onions, garlic, chocolate, raisins and grapes. For a complete list of foods and household items that are dangerous or poisonous to pets please look at the. AVMA’s brochure and video. Feeding your dog foods that are high in fat can lead the pancreas to overwork and become inflamed. This is serious and can be extremely painful. Signs of pancreatitis include severe abdominal pain, loss of appetite, vomiting, diarrhea, and depression. Hospitalization and intensive medical treatment are required. Left untreated a severe case of pancreatitis can even result in death which we DO NOT want. When the house is getting quiet and everyone is heading home please make sure your garbage can is on lock down. If your dog or cat are able to get in and grab cooked bones we may have a big problem. Cooked bones that are chewed and swallowed can splinter, break and lodge in an animal’s throat or intestines with life-threatening consequences. To ensure everyone remains healthy, make sure all leftovers are thrown away and out of your pets’ reach! Myth: Dogs need to chew on bones to clean their teeth. Not true. 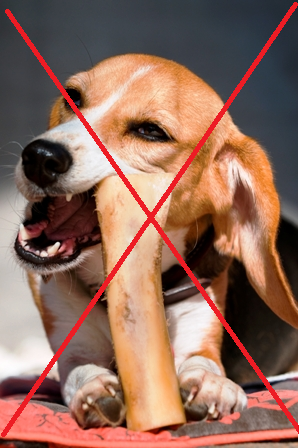 Allowing your dog to chew on bones is subjecting them to fractures and even broken teeth. Bones are stronger than the enamel of your dog’s teeth. If you are giving them bones to help keep their teeth clean. Don’t. Brush your dog’s teeth daily with enzymatic toothpaste. Have the teeth professionally cleaned yearly as needed. But do not allow your dogs to chew on bones. Chewing on bones causes damage/pain to your dogs teeth. Myth: Dogs are able to eat bones because that is what they did in the wild. Wrong. By allowing your dogs to eat bones- accidently or intentionally you are leaving your dog open for potentially life threatening intestinal/digestive problems. While walking your dog if somehow they grab a bone, immediately seize the bone as soon as possible. Perhaps you had chicken for dinner for example, or a dinner that has bones left over. Please discard them safely. Somehow with bones in the trash your dog will find a way to open the trash can and feast on the bones. This is very dangerous. It just takes one bone to splinter causing a very sharp edge that can cause damage to the intestinal tract. It may need to be repaired surgically. My dog ate some bones and is now very constipated. That should be a signal to you to bring your pet into the doctor immediately. Believe it or not the ingested bones can obstruct the digestive tract. They cannot pass them. Your pet perhaps will need to be disimpacted and have enemas to try and remove the digested bones. If that is not possible depending on your pet’s condition and age surgical intervention may be needed as well. This all can be avoided by not giving bones and disposing of them properly. Bones are unsafe for your dog. In this podcast, Dr. Larry Kornegay, president of the AVMA, talks about why it’s a bad idea to give your dog a bone. Take a minute and give a listen.